Today’s small family farmers and ranchers are Rent Mother Nature‘s pioneers on the front lines of the “green” revolution. They all share one thing: They understand the grace Mother Earth bestows upon us in the bounty of her fields, forests, and seas. Some of these new pioneers were born to farming, some have chosen this life to learn ancient crafts & skills, while some just like to get down in the dirt & experience nature. Whoever they are, whatever their philosophy, and whatever they produce, they share one trait: They are the risk-takers. They are the little guys who take on the juggernaut of agribusiness by using the weapons Goliath cannot, because his hands are tied by the very business practices that made him a giant in the first place. And even more telling, Goliath doesn’t understand the newly aware consumers (once primarily upscale, but now popping up across the social spectrum) whose vocabulary now contains words like organic, earth-friendly, natural, sustainable, free-range, cruelty-free, non-GMO, hormone-free, provenance and- good heavens – fresh, healthful, tasty, and socially responsible! It is the niche markets that keep our family, community, and cooperative farms alive: products and produce Goliath can’t bother with – farmstead dairy, hand-sheared and non-dyed wool, hand-culled wild rice; chemical-free, non-hydrated dates; uncooked, unfiltered raw honey; shade-grown organic Fair Trade coffee. The risk-taker might start out by researching the most profitable niche markets and choosing his product accordingly. Or he might have a passion for, say, goat cheese and will happily tend his goats & develop cheese-making skills for months on end with an eye out for the gourmet cheese market. But there’s much more to it than finding the right fit. There is the process, the connection that links farmer or rancher or craftsperson to the consumer. The conscientious principles and standards on which they base their labor add incalculable value down the road – to the processor, the distributor, the seller, and, ultimately, the consumer. Each step along the way adds meaning to the entire process. Family farmers and ranchers develop standards for premium markets, form collectives for marketing and distribution, assist one another over the rough spots, influence public policy, challenge outdated regulations or those that favor only the agribusiness giants, and ultimately convince the consuming public that quality produce and product is still available. The growing popularity of farmer’s markets connects small family farms to the consumers who value them. City-dwellers gain access to fresh foods. Farmers gain access to a wider market for their products. This works well for individuals and restaurants that want fresh local food. One problem that farmer’s markets do not solve is how to get fresh food that is not grown locally? Good food that is grown by committed farmers is always in season somewhere. A husband and wife tend a small stand of organic medjool date palms in California. Two cousins head out to gather their prized wild rice from a secret lake deep in the woods of Northern Minnesota. A shepherd cradles a newborn lamb in Vermont. 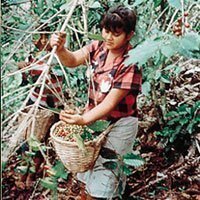 An entire family, from the babe on her mother’s back to the sturdy patriarch, spread out through orderly rows of coffee trees beneath the rainforest canopy in the mountains of Nicaragua.